From one of our mimsiest minions comes word of this unique item. Celebriducks is a company that produces “rubber duck” toy versions of famous figures and characters. I don’t know why. They just do. 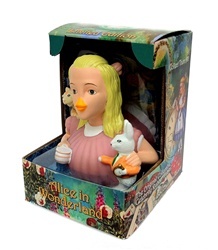 And the range of their line is quite extensive, so it was perhaps inevitable that our Alice would eventually be “duckified”! Interestingly, she seems to be wearing a pink dress, which is refreshing. In a nice touch, they’ve included the White Rabbit and Cheshire Cat, as well. For more information, or to purchase this unusual item, click me.